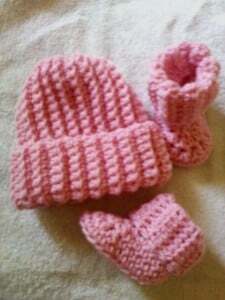 This adorable baby hat and bootie set has a nice ribbed texture to the design. It’s designed to fit a newborn to six month old baby, thus making it great for baby shower gifts. The pattern recommends a DK #3 yarn, and a 5.5mm crochet hook. If you enjoyed this free crochet pattern you might also enjoy more designs by Joyful in Tribulation.